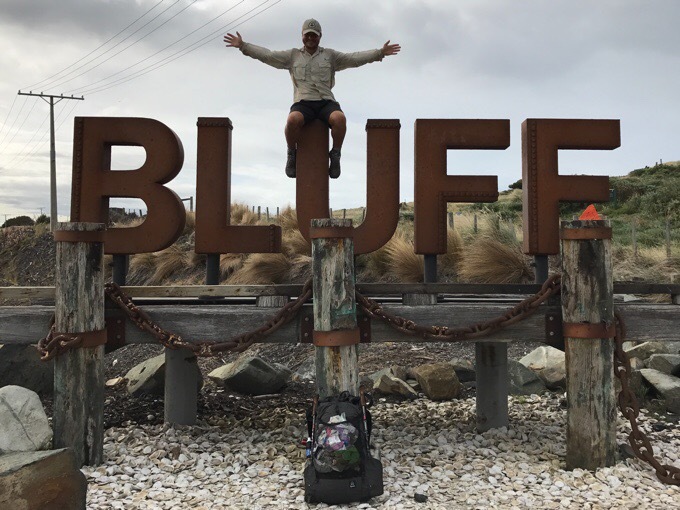 Day 120: Bluff Or Bust! We knew it was going to rain by noon, so we got an early start and packed up in the dark hoping to beat the rain. It was a calm and mild morning. 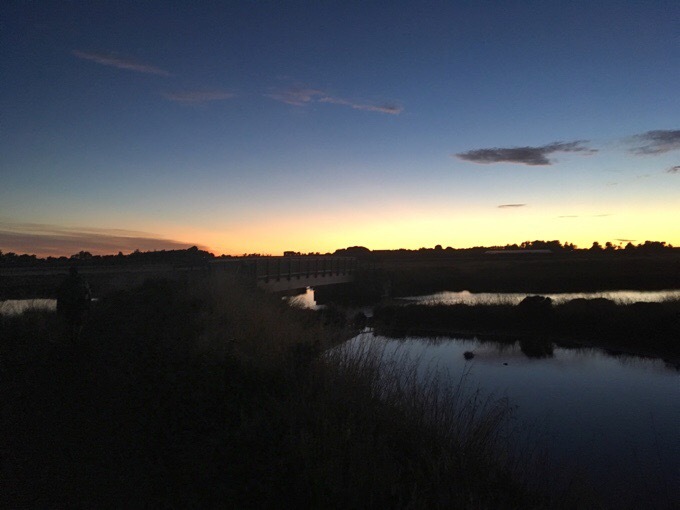 We walked in the dark on the Invercargill Estuary Walkway/Bikeway as the sun came up and gave us a great color show with the clouds. Then the highway walking began. It was pretty classic to end the TA this way. It was a few hours of highway walking that felt like an eternity. There was a ton of traffic, much of it tour buses and trucks, so I was glad I took my time to reflect yesterday on the beach. It wasn’t happening today! I was entertained listening to the radio when they announced that they were going to stream Ed Sheeran’s complete new album that was released today. Each hike I do, there are certain songs that remind me of that hike that were current or that I heard many times over the hike on the radio. 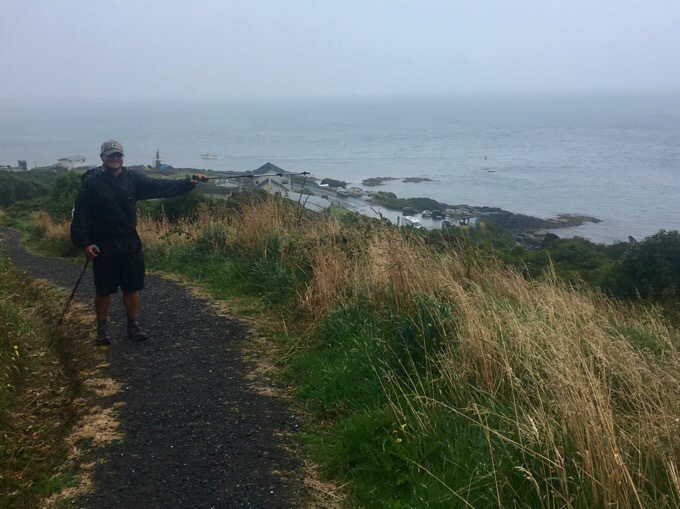 One of the songs that will always remind me of this hike is Ed’s “Castle On The Hill.” It is played a lot on the radio over here, and I was fully entertained to get to hear the whole album over the road walk to Bluff. We could see Bluff in the distance almost the whole way. 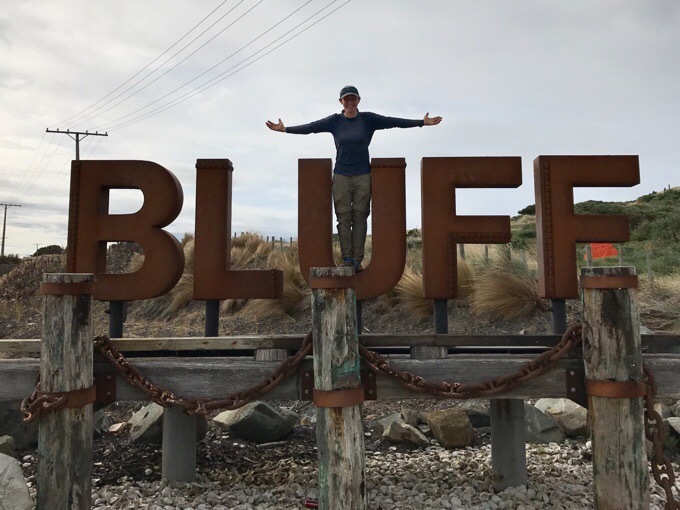 Although there is Stewart Island to the south and many other islands, Bluff is considered the southern most city in New Zealand. I’ve attached a photo for reference to visualize how the hike ends. Normally, it would walk around the west coast of Bluff to Stirling Point. However, the last section there has been closed for over a week due to a private farm land that has some dangerous bulls there at the moment. 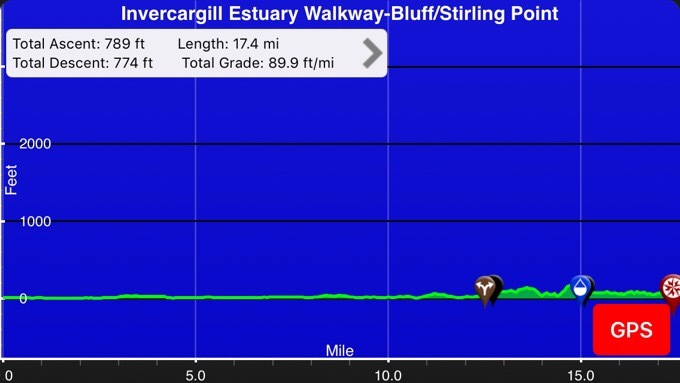 The options are to either continue walking the highway along the east side, or to head over The Bluff summit in the middle to then drop down to Stirling Point. We decided hike to the top of The Bluff since it really would have felt odd to finish such a journey on a highway. Plus, we thought it could be a great view as we hiked down. Unfortunately, the rain kicked in a bit early our final hour to the end. When we got up the climb, the views were socked in, and we made a wrong turn for a bit trying to find the right trail down. 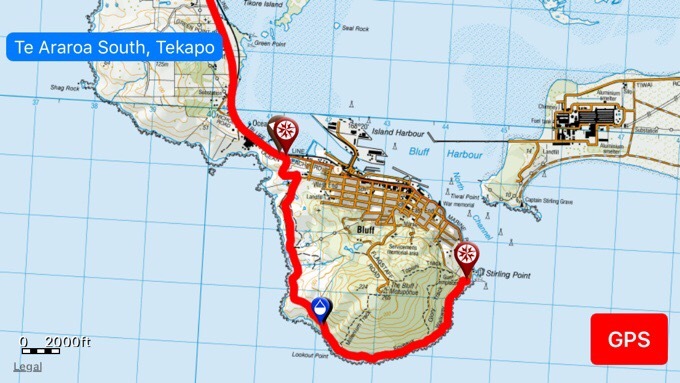 We knew we needed to take the Topuni Track down to Stirling Point, but the GPS had the track in a different spot. Eventually, we figured it out after getting all the way to the top and ignoring the base map track on the GPS. If it looks like this, you took the wrong track. 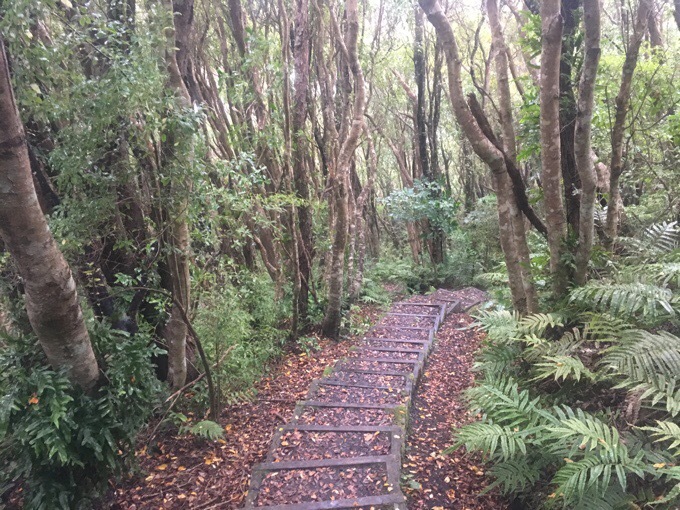 For other hikers doing the same thing, just go all the way to the top and the signage will clearly direct you to the Topuni Track, which is a breeze and a great way to end the hike. We had some nice wooded trail and then emerged to a view looking down on the yellow signpost at Stirling Point. That’s how it should look! 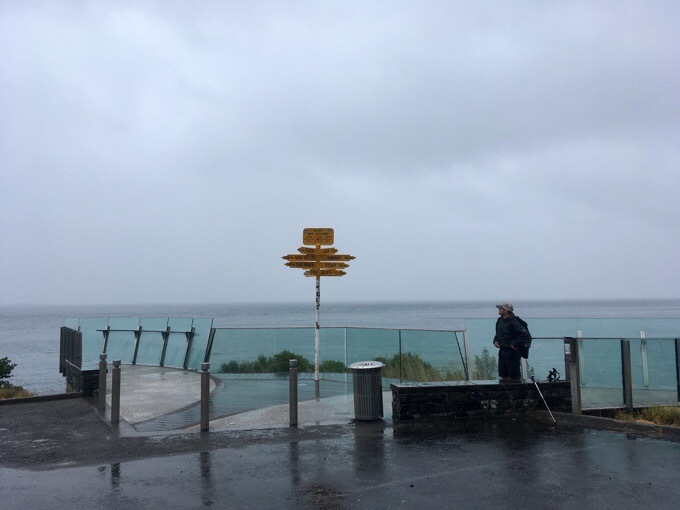 Stirling Point and the yellow signpost below. When we got there at 11:45am, there was a light mist of rain, and there were far fewer tourists than usual. 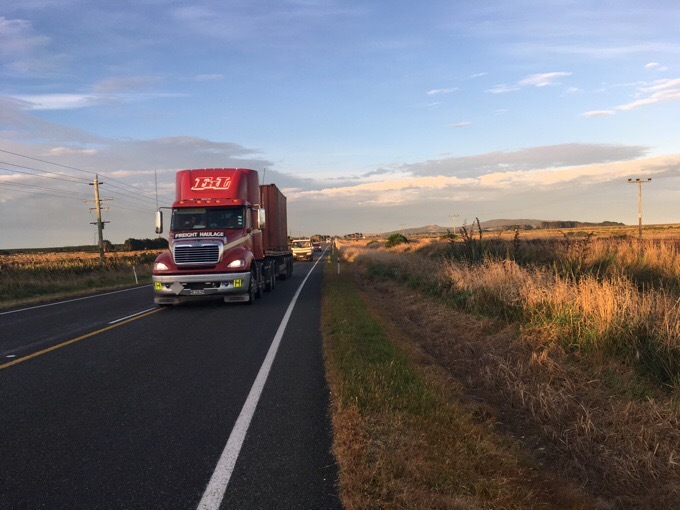 It’s a popular tourist destination and the beginning of a scenic highway many people take up New Zealand. It was pretty great to get time to relax there and get it to ourselves for the most part. Of course we took a ton of fun photos individually and together. I have to include one of our outtakes, which apparently shows Griggs’s hidden talent of working a stripper pole. Does he really have to excel at EVERYTHING!? The people taking our photos at the end were an American couple here for their honeymoon. They were driving through Invercargill, and gave us a ride. As we drove off, a full tour bus of preteens was parking. Man, we just dodged a crowd! 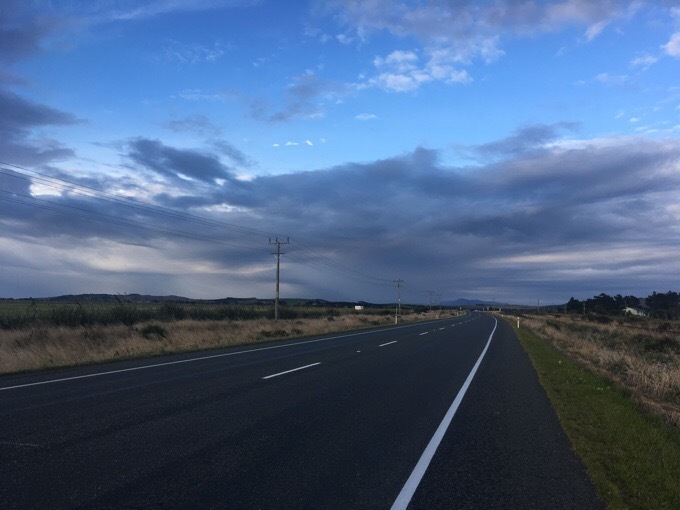 As we drove to Invercargill, we saw Min and Josephine each a few kilometers apart as they were walking the highway to also finish today. It was fun to pull over for each of them and give them one more hurrah as they powered on. The temps had dropped significantly, and the wind really picked up, so although we had rain, we made it out before the tough stuff came. 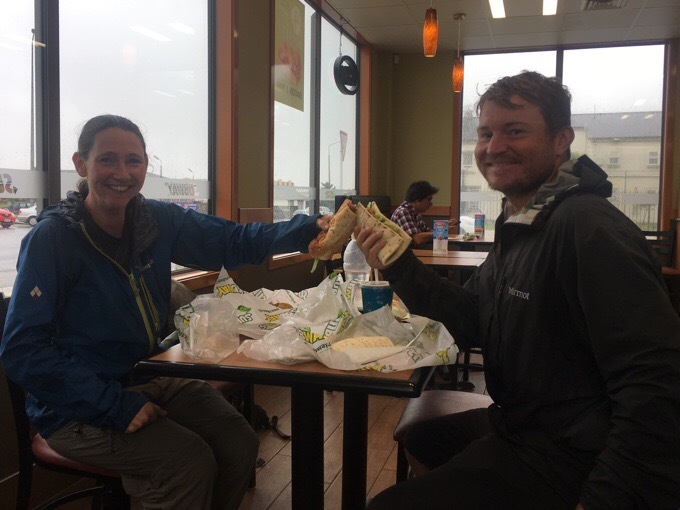 Less than thirty minutes after finishing, we were having our celebratory lunch at Subway! 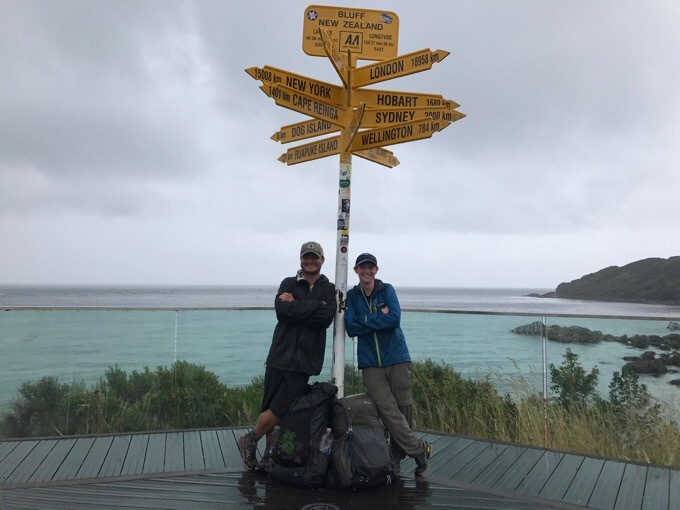 We checked into the Southern Comfort Backpackers and the hot showers were heavenly with how cold and wet we were by that time. It’d been six days since we showered, so it was well overdue and felt amazing. Then we went down to the Kathmandu outdoor store and I got new hiking poles. A big THANK YOU to Lou and Liz (who I celebrated the end of the South Island with in Wellington) who were kind enough to gift me these after hearing I’d broken one of mine. I do love the Fizan poles, and was really happy that they not only sold them at Kathmandu, but were part of a huge 40% off sale they were having. Sweet! Griggs and I also got thin fleece pullovers for Tasmania. 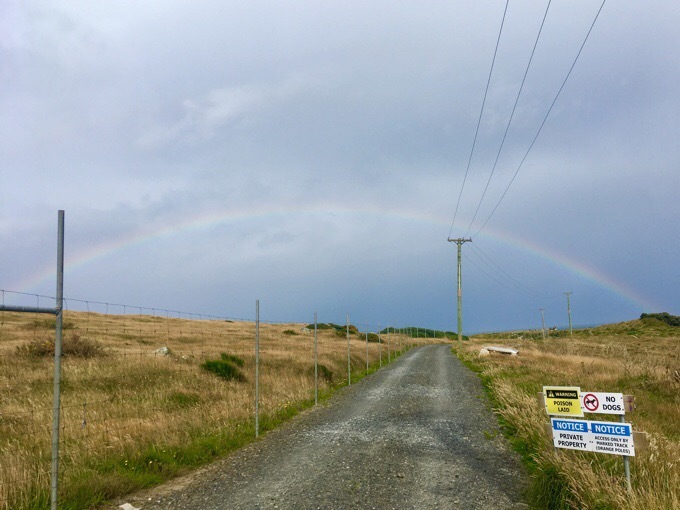 It will possibly be colder and wetter in Tasmania, so we wanted to have one more warm layer that would work well with a lot of rain if needed. We are totally matchy-matchy as we both bought the same ones that were on sale. At least they are in different colors, ha! Yeah, now everyone will for sure think we’re a couple, ha! Again, just great hiking partners everyone. After going to Kathmandu, we went to the post office and got our bounce boxes for the final time in NZ. Then we headed out to the Buster Crabb restaurant and had our big celebratory steak dinner. It was awesome and I totally recommend it for people celebrating their hike! They even made me a great chocolate milk! Celebration dinner in our matchy fleeces. Hello Erin. Tom’s dad here. 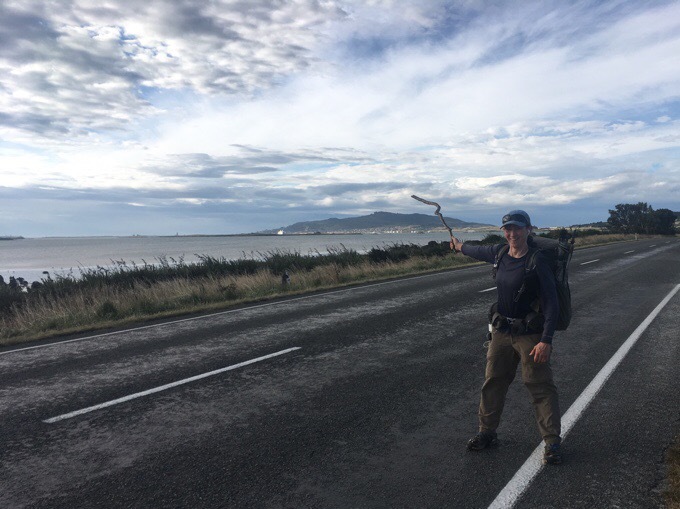 Congratulations on a truly superb thru-hike of New Zealand. All admiration and respect to you, and to all the hikers that have been a part of your journey. 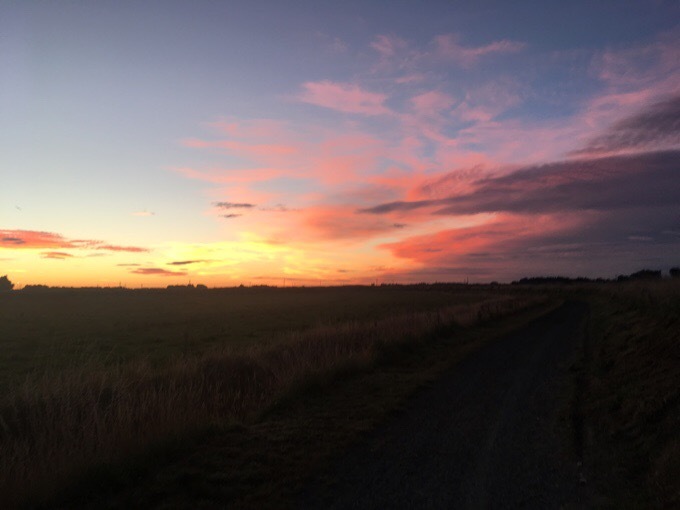 I have thoroughly enjoyed your blog, and as a kiwi, I feel an even greater appreciation of my country now. You have an amazing self-discipline writing every day, and expressing yourself so honestly and eloquently. Thanks for sharing the journey, with all those wonderful photos. 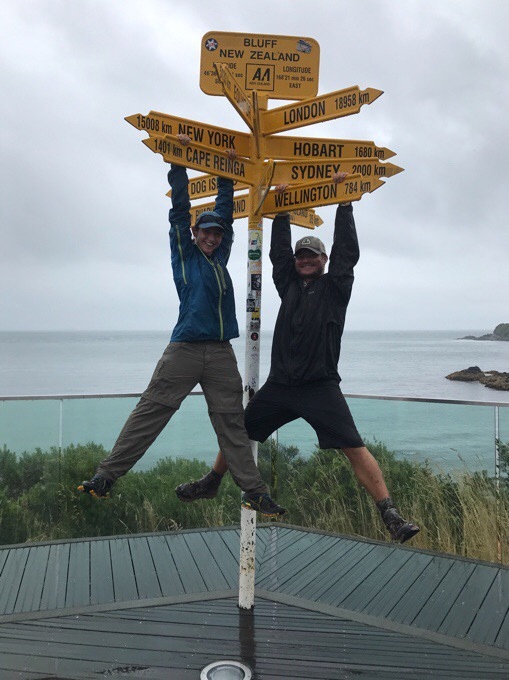 When Tom & Becky finish Stewart Island, they will come and visit us in Auckland. We look forward to meeting Becky. I hope you and Griggs have a successful tramp in Tasmania. All the very best to you on your ongoing journey of life. Aw so great to hear from you and so happy to also share their journey as well. You’ve raise a such a ray of light and it was wonderful to be able to spend some of this journey with Tom! Awesome Erin, well done on completing another hike!! I love the way you are able to cope so well mentally with whatever is thrown at you on these hikes.. for some reason my emotions go all over the place, one day is the best ever, the next I want to end it all etc etc.. you are so good at keeping a level head. Golly, four months .. America will be different by the time you get home! Congratulations!!! What an amazing journey you´ve made. Congrats on finishing! I’ve been reading your blogs since mid PCT and feel as though I thruhike vicariously through you. I miss it when you are off trail and not writing. Can’t wait to see and read about Tasmania. Congratulations Erin and Griggs! Enjoy the next adventures, friends, flying like an eagle, and Tasmania! Congratulations Wired !!! what any amazing hike. I think the Class of 16/17 had a tough thru hike with the number of weather bombs, fires, road closures and earthquakes! NZ certainly threw some extra challenges if the TA wasn’t enough in itself! We really admire your strength and ability to spend the time to blog at the end of such tough days! Enjoy your next adventure- can’t wait to read about it all. P.s glad you were able to get your favourite poles ? THANK YOU Lou and Liz for being part of the journey in multiple ways! Many congrats, Erin! So much fun. 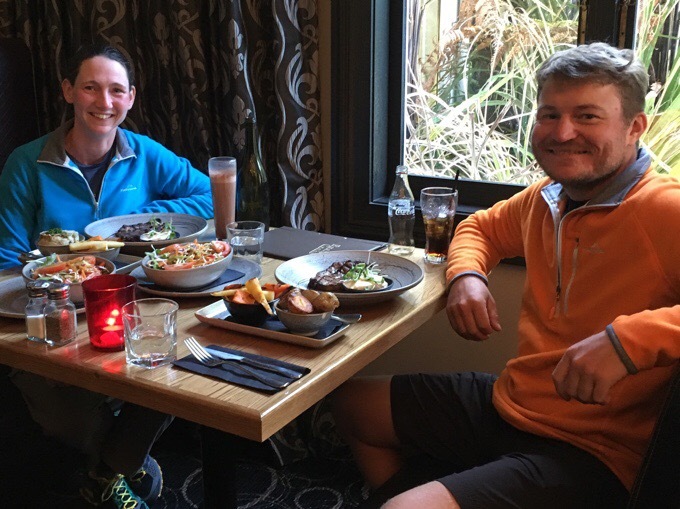 Have fun in Tasmania! Congrats Erin. I love that you and Griggs are rockin the Illini orange and blue! Hope to see you somewhere along the trail again this summer. Haha! We joked that our colors must be some kind of team color and I commented that if mine was navy, it’d be the Illini colors. Love U of I and a proud alumni!!! Sob … it’s over. However, congrats ! 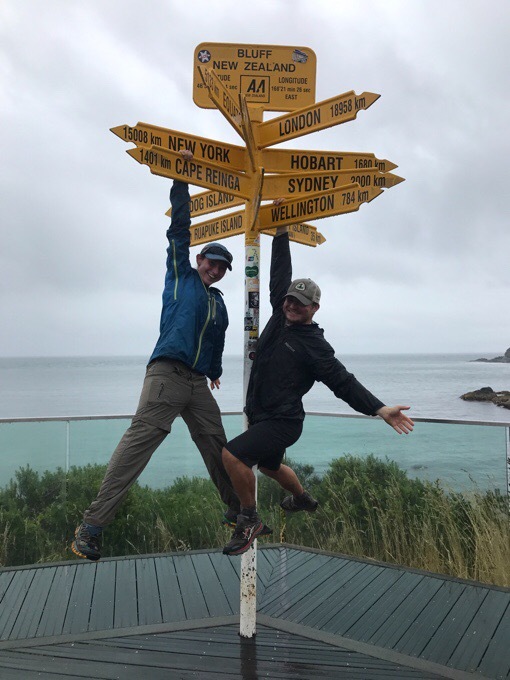 Australua, New Zealand, now on to Tasmania. What’s next? Will you be looking for a way to get to Antarctica? Hopefully, the less cold part of the year, if there is such a thing? She has since passed when the cancer went to her brain, but what perserverance and what adventure. So, yes, there is a “summer” season there and I hope that is when E is there?? Check out the documemtary “A Year on Ice”. It’s about the people who work and live on Antarctica year-round. I thought it was very entertaining anyway. Maybe Wired can get a job at the US Base. That’s about the only way you get to visit Antarctica, having a job there. It’s overnight hikes at most there. No through hiking the other AT (Antarctica Trail). Well done and the best of luck in Tasmania. It’s a fabulous place and I’m sure you’ll have blast. Another amazing thru hike under your belt. Congratulations. Fantastic effort. I wonder how many kilometres you have now hiked since starting your summer hiking in the US. Good question! It’s actually much less than you’d think. Most of the hikes I’ve done over the last 8 months have been more challenging ones with much lower daily mileages. Since the end of June, I’ve done 3535mi/5689km over 9 long trails. That was fun to calculate. Thanks for asking that one. That is absolutely incredible and your long summer is not done yet. Your boots [feet] were definitely made for walking and that’s just what they do! OMG. you bough a fleece, welcome to the fluffy clothes owners club , ha ha ha. Kathmandu clothes are pretty good, they use top quality materials in a lot of their gear, good quality fleece. just don’t pay full price, they over inflate their normal prices to make the sales price look better, the sales price is worth paying usually…, and they have regular sales, stores have clearance sections and if you can find their outlet stores then everything in those is permanently on special. Yes, we found the “sale” price for my poles were the regular price anywhere else. The fleece were also 40% off and an even better deal when we know what it cost us in US dollars. The fleece kiwi thing has rubbed off! Glad that you were able to find your favorite poles in an unfamiliar place. Gotta love the Skype still of your sister and her cute kids doing the “Wired” pose. They’ve done it so much, it must be natural for them. Your biggest supporters. Congrats! Another one in the books. You continue to be an awesome inspiration. It’s over?!? Dammit, what am I supposed to read NOW? Haha! I know how you must feel, but I’m just waiting for the day I can go to bed and watch a show and not have to blog! I can’t believe there was a rainbow! Time to settle down perhaps? Love your blog! Thanks for taking us along your journey. I’m really excited what your next plans are going to be, maybe a trip to Europe? Congratulations to you and Griggs. What a hike you had and one more to look forward to. At this time last year all of this was just a dream….not any more. YAY! WAHOO!!!! I’m going to be so sad not having this TA blog to read. Hopefully you are taking this week to relax, recoop and watch the season premiere of Survivor!!! That was the first thing I thought of, and then realized Survivor premieres the first day we start the Overland Track! 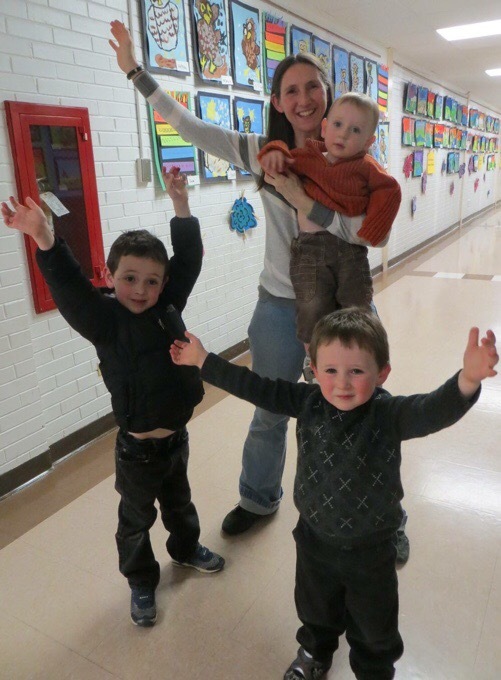 love the pic of your sister and nephews ! Started watching your blog when you were slogging thru the snow in the Sierra on the PCT. Congrats on finishing another through hike. I admire your determination and grit. Ah, a long time “viewer”! Congratulations Erin and thank-you for sharing. We so much appreciate all of your writings and photos. Best wishes for your next adventure. So much in this post.. and the comments.. Completion.. of the trail, with rainbow, goodbye to the crooked stick.. but it was featured in a picture, the iconic sign (I well remember when Nancy reached that very sign). Renewal.. spiffy new poles, a gift from two good hearts (who were, I am sure) so happy to spend time with you and Becky earlier.. that entire post was a nice look back for me). Renewal in meeting with friends there, and for Griggs, renewal of more adventure. Renewal of warm showers.. New shoes. Comfort of warm fleeces, and the wonderful comments from Tom’s father.. and your adorable sister and your three cute nephews. Chocolate milk!! Looking forward to more as you rest up, then off you go again. Well done, Erin and Griggs! We’ve not met, and I learned of your blog somewhat late in your hike of NZ, but I enjoyed your reports immensely. Here in America’s Pacific NW, we’re looking fwd to spring, although the cross-country skiing at Mt. Hood is exceptionally good right now. Brilliant ,congratulations ,you did it ! I loved all the steps and mud and mountains and even the rain ☔️. What a fabulous hike . Thanks for taking me with you and thanks for all the photos . I look forward to Tassie . Great adventure you have shared. Looking forward to Tasmania. Glad you still like the Fizan poles enough to buy another pair. I bought some from Massdrop after reading you used them. Safe travels, Backfire. Oh I hope they work out well for you as well. Mine lasted through a ton! Oh man, that will be crazy! Congratulations! I love reading this. I love your transparency about your feelings and what you are experiencing. I also love learning about the people you are hiking with, getting rides from, meeting in town. Glad you are keeping us posted about Becky! I also loved your post about the food. Whenever I travel people ask “What is the food like?” so I take pictures of the food. Thank you Sue! I am terrible about mentioning the food. I’m so not a foodie, but being on the trail is the one time I’m hungry enough to really indulge and enjoy large quantities of it. love the poles!! What sort of shoes? I have just finished another leg of the Bibb but have pulled up with shocking blisters any suggestions? It’s my second pair of boots and not sure where to go with my footwear. my current pair are salomons i loved them the first hike and even though walking through water (Oct) only got x1 little blister. I noticed that you said you got blister on your first thru hike? I’ve always used trail runners. Loved Solomons, but they discontinued what worked for me. Settling now with La Sportiva Bushidos, but they don’t have much cushion and I will switch if I can find better. All feet are different. I don’t blister much, but in multiple rain days or the first week if I haven’t hiked in a long time. Congratulations! Calvins mom here. You are an amazing person with so much discipline, strength and kindness. I have truly enjoyed your blog and want to thank you for sharing your journey. 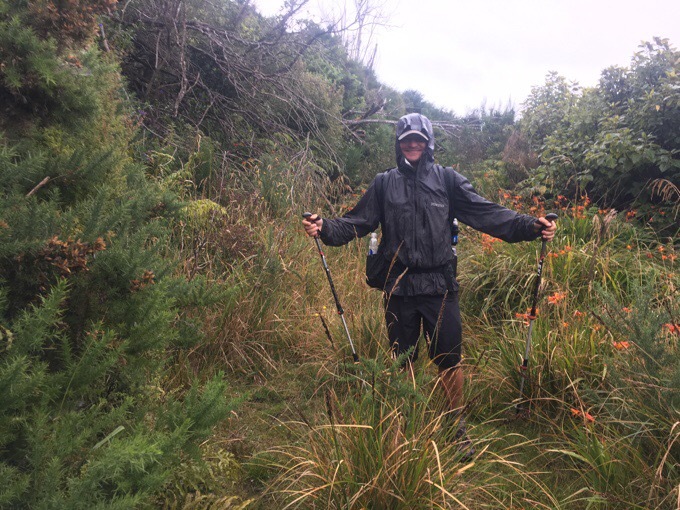 What was your greatest challenge hiking the Te Araroa? Was the North island more difficult than the south? Good luck in the future. I will stay tuned in. I can’t believe its already over. I can still remember that day we were sitting on the bus to Kaitaia…it seems like just yesterday. I am so glad we met on this trail and got to share a few wonderful moments. Magnificent, congratulations Erin (and Griggs). 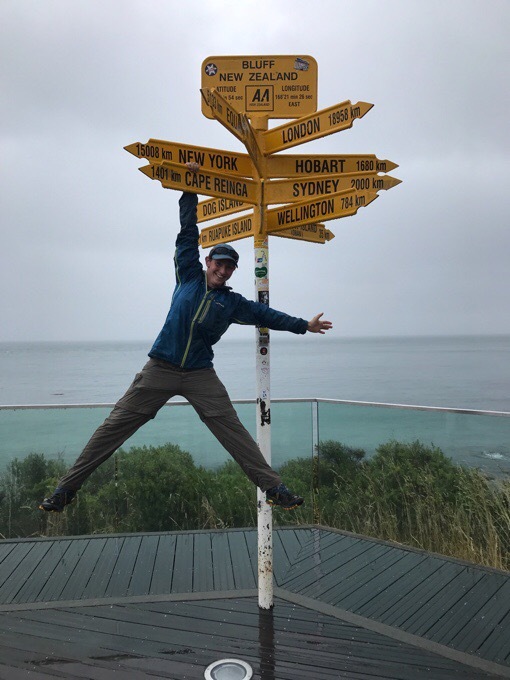 Just got back into Oz yesterday after my 16 day NZ walk over Rabbit Pass, Cascade, Rees, Cables, Greenstone, Mavora etc and had to jump on-line and check out the last part of your adventure. 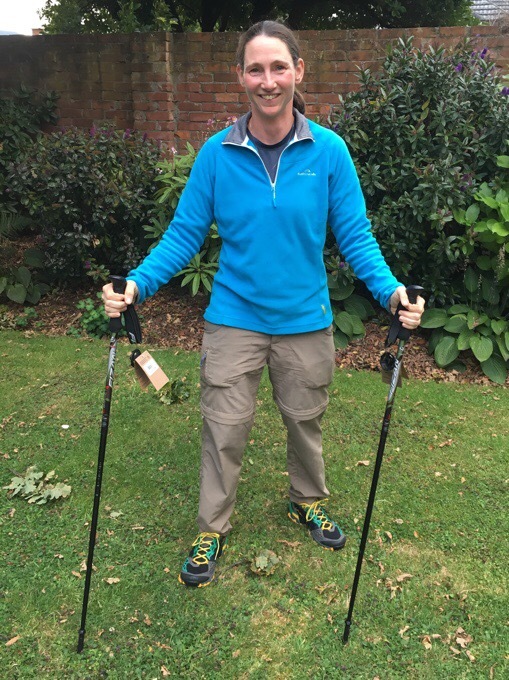 Many thanks for the massive effort you put in for this (and all your other walks)…..RESPECT. Oh awesome that you did it! Too bad we didn’t overlap. It’s a great stretch. I have to ask what you thought of Rabbit Pass?